Brentsville was located around the new court house in 1822...The Courthouse, clerk's office and jail are handsomely situated on the main street, in a public square of three acres. Besides them, the village contains 19 dwelling houses, 3 miscellaneous stores, 2 handsome taverns built of brick and stocked, 1 house of entertainment, 1 house of public worship, free for all denominations, a bible society, a Sunday school, a temperance and a tract society...There is in the vicinity a common school in which the rudiments of English education are taught...Population 130 persons, of whom 3 are attorneys and 3 regular physicians." (p. 113, Prince William: The Story of Its People and Its Places, Work Projects Administration. The Bethlehem Good Housekeeping Club, 1976). Brentsville served as the 4th Prince William County seat from 1820 - 1894. During the Civil War, the town's proximity to both Manassas Junction (approximately 4 miles to Brentsville's northwest) and Bristoe Statiion (about 2 1/2 miles to Brentsville's west) made her vulnerable to the same destruction bestowed upon these towns following the Battles of 1st and 2nd Manassas. Homes like General Eppa Hunton's (8th VA) were burned and the Brentsville Courthouse roof was destroyed. Descriptions from Union soldiers also tell of court records that were strewn in the streets of Brentsville and burned as fuel. Brentsville native sons were recruited and drilled on the Courthouse grounds in preparation for service with the 4th VA Cavalry and the 49th VA. 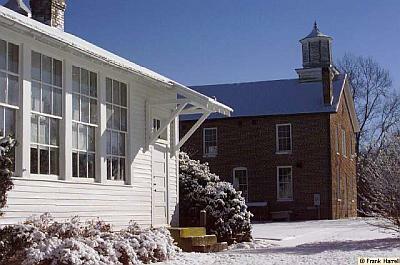 Following the Civil War, Brentsville remained the center of Prince William County government until January 1, 1894, when the county seat was moved to Manassas. Three separate referendums were required before Brentsville's 74 year legacy as county seat ended. However, the Town of Brentsville, still straddles historic Bristow Road (VA Route 619) in the exact geographic center of Prince William County ) today.